Daphne Blake, played by Sarah Jeffery in the 75-minute film produced by Ashley Tisdale’s Blondie Girl Productions, starts her first day at Ridge Valley High by asking her smart home to turn up her pump-up playlist. She walks over to her ClotheMe Closet™ and tells it that she’s looking for “the perfect first-day of school outfit”, dresses in the robotic wardrobe’s selection, and descends the stairs while musing aloud that she hopes that it’s French toast she smells. Last week, I asked what exactly it meant to be White. Today, I’d like to step back and show you what it was that brought up this question in the first place. Now that got posted by a friend of mine. Good guy, but with a habit (in my opinion) of reposting whatever liberal dreck pops into his FB feed without taking the time to question it. Allow me to break down why that image is such festering garbage. First and foremost, it’s unbelievably racist. Not white-hoods-and-burning-crosses racist (we’ll get to them in a minute) – we’re talking the condescending, insidious racism of White liberal elites. A little over a year ago I spent four months in Indonesia. I didn’t really travel across the country, at least not in the way you would expect during that much time abroad. Instead I had the great privilege to live in Indonesia, and see it from the inside. It’s hard to put to words all that I learned, and impossible to do justice to the people I met and the experiences I had. Here is my attempt to share are a few things I learned while I was travelling. The first notable quality of almost every Indonesian I encountered, and especially of my host family, was their hospitality. Within 12 hours of arriving my concept of generosity and hospitality had been put to shame. My hosts not only shared their home, they shared their family, lives, and friends with me. I was adopted into their social circle, taken for day- or week-long trips by their friends while I was there. I was honoured to be one of the first people to greet the family’s first grandson alongside the immediate family. This is a fairly potent topic these days so I won’t comment too much. Over half the women on Java wear hijabs, a head covering worn by Muslim women. When I asked why they wore them, all the women I asked answered with “I wear it because I choose to.” I began to recognize beauty and comfort in these headdresses, as well as freedom of expression. These women were neither ashamed nor pious in their religion, it was simply a part of their life. Today, on International Women’s Day, I’ve been reminded of how grateful I should be. Maybe it’s because I’ve been flipping through images of women’s protests around the world. Maybe it’s because I’ve been watching sentimental videos that make me feel inspired (even if they are marketing ploys by Google). Either way, I can’t help but feel grateful. By the time this post goes up around midnight tonight, it will no longer be International Women’s Day. Before then, I’d like to take a moment to be thankful, and highlight ways we can support other women in their fight to win these privileges too. When I get up in the morning, I do not feel afraid. My country is not at war. My physical safety is not threatened. Throughout history, this was not something most women could take for granted. In many countries around the world this is still something women cannot take for granted. I struggle with the priorities on my Facebook feed. Like many other millennials, I get a lot of my news from scrolling through Facebook. I try to follow as many different news sources as I can, hoping to hear information from a variety of perspectives. I’ve never deleted anyone simply because they have a different opinion, since I need to be reminded that my opinion is far from the only one. That said, I live in a nation of privilege. From my home in Canada, I am more often than not bombarded by “First World Problems” that seem to pale in comparison to news from other some nations that splash across my screen, albeit much less often. This month I got to go out and cast my vote in the Canadian federal election. I owe this privilege to women who came before me. Women who sacrificed their time, energy, and sometimes their lives because they believed that we deserved the same privileges as men. Because I’m thankful for the sacrifices those women made, I’m ecstatic to see a film coming out this month that celebrates those women and explores what they went through in order to win us the freedoms we have today. I know. Pretty well every woman with a computer has written about how great Mad Max: Fury Road was. I actually meant to write about it last week, but then I decided that I needed to address the news about the Duggars instead. Not only am I late to the Mad Max conversation, but when I went to write about this post I came across the video I’ve included below, which succinctly summarizes many of the points I was hoping to make. Even though Rowan Ellis beat me to the punch with several of her points, I loved this movie too much not to add my two cents. I also wanted to dig deeper into some of the feminist identities offered in the film and how they impacted me as a female viewer. Spoilers, obviously. 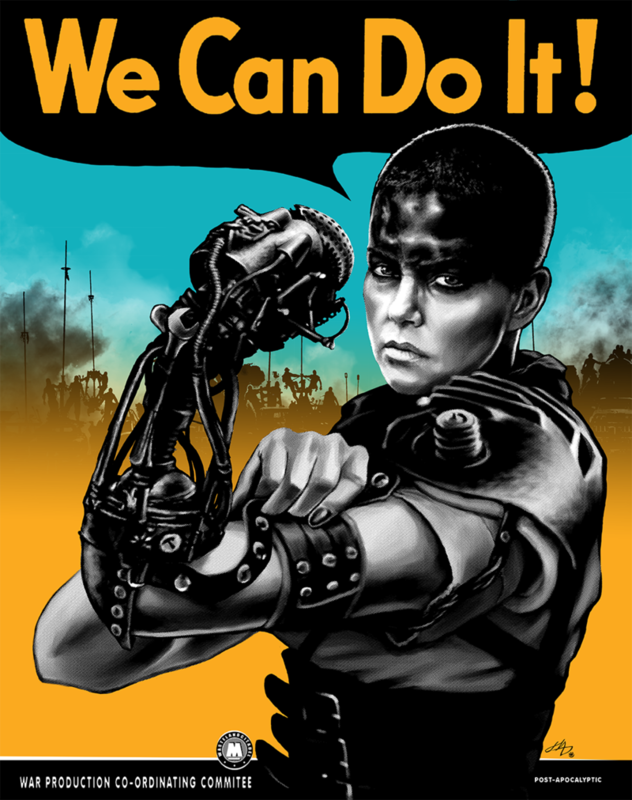 Furiosa is, of course, the first person anyone is going to think of when I say “strong female character”. She is a brave, intelligent, and capable character. I also love that she isn’t sexualized by the camera angles, and that we aren’t forced to view her through the male gaze.